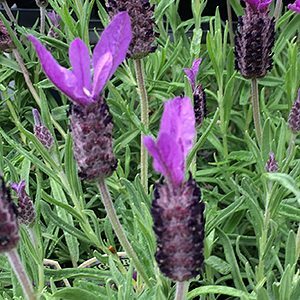 A very popular form of Lavandula stoechas, Avonview Lavender has fragrant flowers and foliage, and a good compact growth habit. Flowering from spring right through until autumn, the flowers are typical ‘butterfly’ eyes, and a good purple colour. Grown in the garden border as well being used as hedging plant, the plant is actually a hybrid between Lavandula stoechas and Lavandula viridis. It reaches a good height and is suited for use a hedge, or pruned to make a low rounded mound. This is a low care plant once established. Ensure a well drained humus rich soil. Plant in full sun to a little shade. Tip prune from a young age. The best time to prune is after flowering, simply cut back 1/3 of the foliage below the flowers without going back into old wood with no green growth on it. Common Name – Avonview Lavender. Growth Rate – Fast to Medium. Soil – Humus rich, well drained and slightly alkaline. Foliage – Mid olive grey green. Avonview does make a good informal hedging plant as it does reach a good size. If you prepare the soil well before planting you will find that the hedge last longer. Dig in some compost and also a little lime. In clay soils you may need to improve the drainage by raising the garden bed a little. Spacing of around 40cm will make a good dense hedge over time, for faster results plant with a spacing of 30cm. Tip prune new hedge plants to promote a good bushy habit. This encourages more branching at an early age and will be well worth it in the long run.